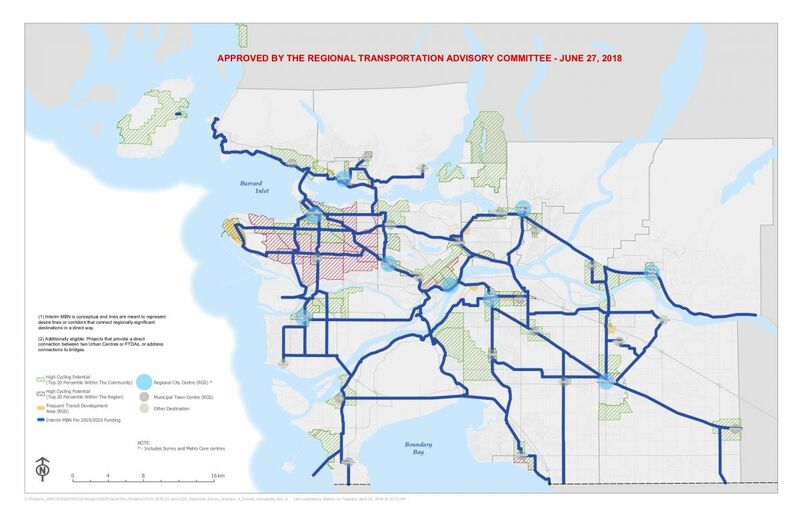 On June 27th, the TransLink Regional Transportation Advisory Committee approved the Interim Major Bike Network (MBN) map and areas of high cycling potential. The updated map includes bike routes that connect urban and other centers as identified in the regional growth strategy. HUB Cycling staff and volunteers assisted with the development of this plan. As the regional transportation authority, TransLink provides funding to local governments to help upgrade roads, walking, and cycling infrastructure. The Phase 2 Investment Plan includes an estimated $7.3 billion investment in regional transportation. The interim MBN map, which will be expanded over time, will be used for making co-funding decisions for TransLink's Major Road Network and Bike (MRNB) and Bicycle Infrastructure Capital Cost Share (BICCS) cost-share programs for Metro Vancouver municipalities. TransLink will provide up to 75% of the funding for projects that are considered comfortable for all people (i.e. Class 1) and located in Urban Centres/Frequent Transit Development Areas (FTDAs) or along the MBN. TransLink will provide up to 50% of the funding for other projects that are comfortable for most people (i.e. Class 2) and/or located in the areas of high cycling potential. The deadline for local municipalities to submit project applications is October 31, 2018.